Lake Titicaca is a large lake in the Andes on the border between Peru and Bolivia. The lake has an elevation of roughly 3800 m (12,500 ft), so these lights are without a doubt the highest lighthouses in the world. There are additional lights on the lake in Bolivia. 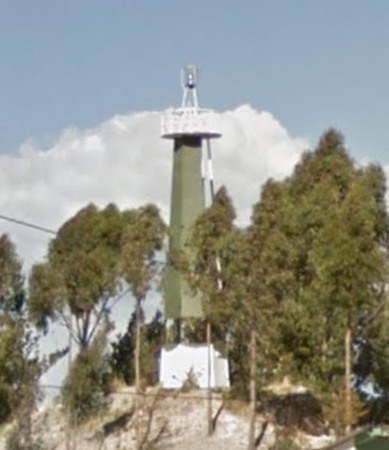 Lighthouses in Perú are owned by the navy (Marina de Guerra del Perú) and managed by the navy's Dirección de Hidrografía y Navegación (DHN). In addition to coastal lights, DHN also manages the lights on the Amazon River and on Lake Titicaca. Some of Peru's lighthouses are located in natural protected areas. A permit from the natural areas protection agency Sernanp may be required to visit these lights. Currently none of the lights of Lake Titicaca are listed in the ARLHS World List of Lights, and the international light lists do not include lights of landlocked waterways like Titicaca. Published by Bolivia's Servicio Nacional de Hidrografía Naval, this notice to mariners (a pdf document) has on page 8 a light list for the Peruvian lights on Lake Titicaca. Date unknown. Active (privately maintained and unofficial); focal plane about 10 m (33 ft); white light, pattern unknown. Approx. 9 m (30 ft) round metal tower with lantern and gallery, mounted on a round stone base. Tower painted with red and white horizontal bands. Bruce Tuten's photo is at right, another closeup photo and a 2009 photo are available, Lightphotos.net has several photos, and Google has a street view and a satellite view. 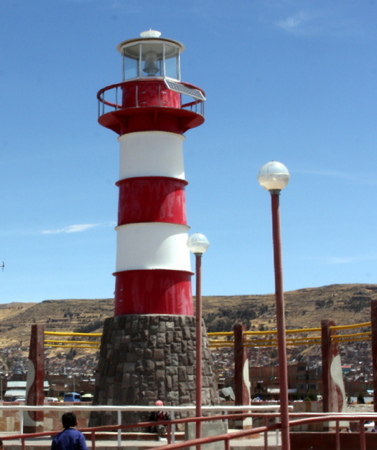 Located at the Plaza del Faro on the waterfront of Puno, at the western end of the lake. Site open, tower closed. Date unknown. Active; focal plane 59 m (194 ft); white flash every 5 s. 6 m (20 ft) triangular skeletal (?) tower, painted white. No photo available, but Google has a satellite view that may show the tower. Located on a promontory at the northern tip of the Socca Peninsula, about 30 km (19 mi) east northeast of Puno. Site status unknown. Date unknown. Active; focal plane 41 m (135 ft); two white flashes every 10 s. 6 m (20 ft) triangular tower, painted with red and white horizontal bands. No photo available, but Bing has a satellite view. Isla Taquile is an inhabited island about 45 km (28 mi) east of Puno. Located at the southern tip of the island. Site status unknown. Date unknown. Active; focal plane 69 m (226 ft); white flash every 10 s. 10 m (33 ft) hexagonal pyramidal skeletal tower, mostly enclosed by green panels. Google has a street view (a portion is seen at right) and a satellite view. Located on a high promontory just off highway 3-S on the southern shore of the lake north of Pomata. Site open, tower closed. Date unknown. Active; focal plane 55 m (180 ft); white flash every 5 s. 6 m (20 ft) square pyramidal skeletal tower with enclosed equipment room at the base, painted with red and white horizontal bands. No photo available, but Google has a satellite view. Located on an island at the southeasternmost point of Peruvian territory in the lake. Site status unknown. Date unknown. Active; focal plane 10 m (33 ft); white flash every 5 s. Approx. 9 m (30 ft) triangular cylindrical mast mounted on a square cylindrical base, presumably concrete, painted with black and white horizontal bands. Sibling of Isla Taquile. No photo available, but Bing has a satellite view. Located at the western end of an island, about 3 km (2 mi) south of Isla Anapia. Site status unknown. Posted June 2002. Checked and revised July 12, 2018. Lighthouses: 6. Site copyright 2018 Russ Rowlett and the University of North Carolina at Chapel Hill.